It’s done! I recently shared my design board idea for the kids’ playroom. Now that we have a 21, 18, 16 and 10 yr. old the playroom is their to-go hangout space. But it was needing a more grown up facelift. 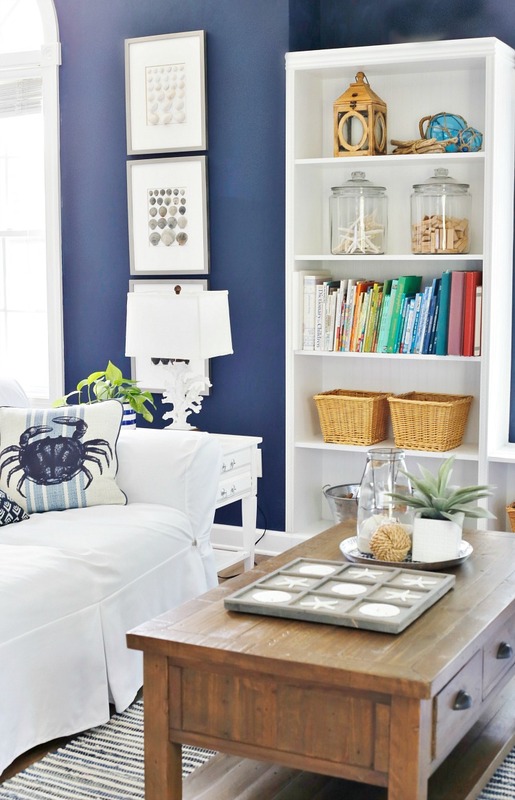 I stepped out of my pale coastal color palette comfort zone and dove head first into deep navy blue, crisp sailcloth white and warm weathered driftwood tones, of course with just the right amount of nautical accents. 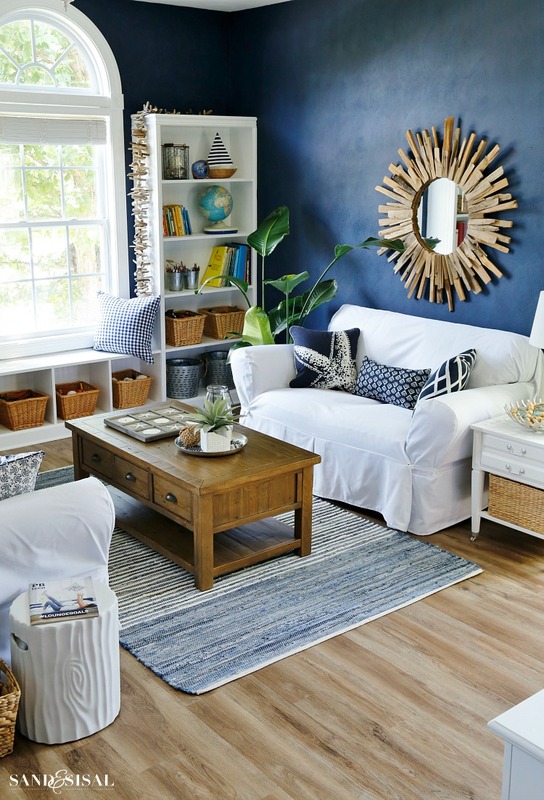 Come see our Nautical Media Room Makeover. Here is a before pic of the playroom. The room was pretty but we were all ready for a change and that carpet was getting gross and had to go. 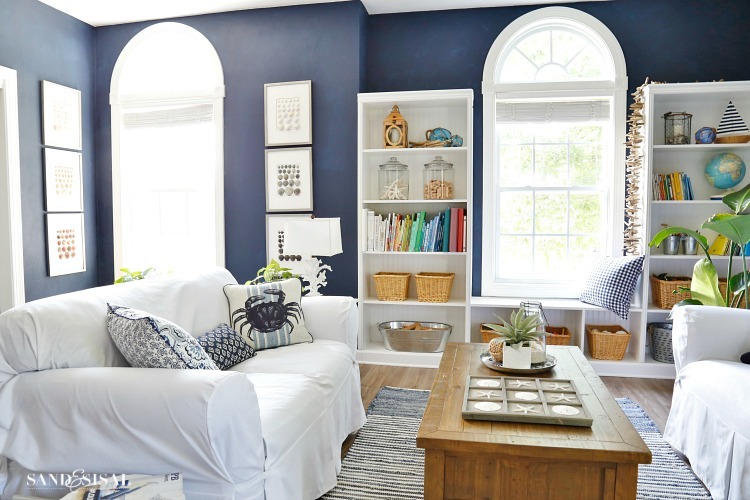 The color of the walls in this pic is Atmospheric by Benjamin Moore. We ripped out the carpet and replaced it with gorgeous, durable, 100% waterproof, luxury vinyl plank flooring from Floor & Decor. We are so thrilled with the flooring, I can’t even tell you! Click the link for a step by step tutorial on How to Install Luxury Vinyl Plank Flooring. We painted the walls in Naval by Sherwin Williams. Our walls have a very textured scroll pattern and are a pain to paint. We put white canvas slip covers over the brown leather love seats. They look so crisp and clean against the navy blue walls. And we added a new coffee table. 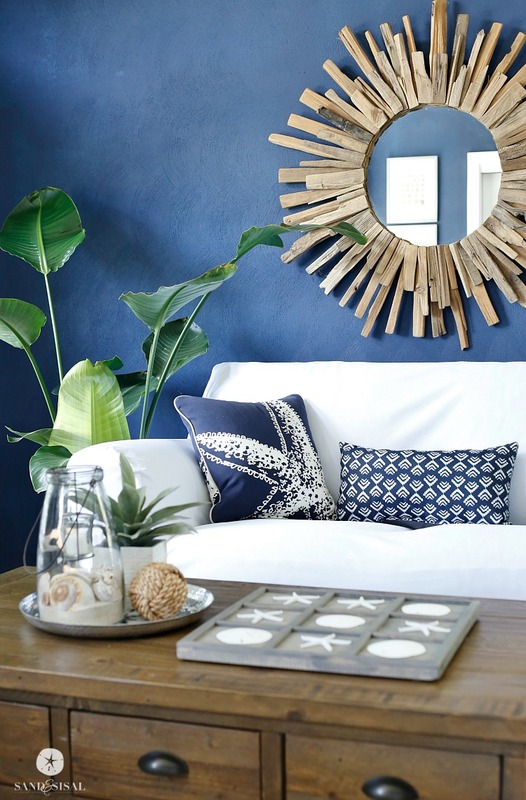 I especially love how the driftwood sunburst mirror looks up here in the media room/rec room, teen pad, whatever we are calling it. The coffee table is perfect for playing games on. 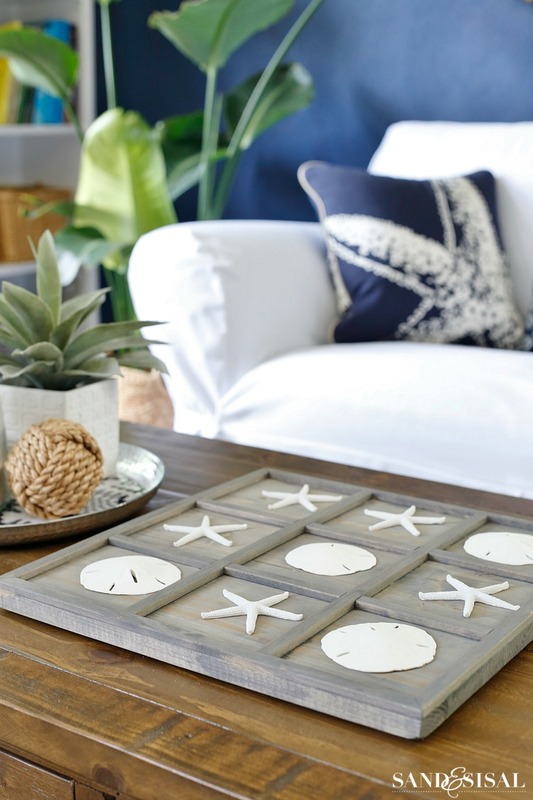 A fun game that looks fabulous on the table is my DIY Coastal TIC-TAC-TOE game board complete with starfish “X’s” and sand dollar “O’s”. (Click the link for the step by step tutorial). Isn’t it adorable? Just a few more nautical accents were added, like a driftwood garland, sailboat, glass floats and crab cage wire lantern. The navy blue makes the palladium windows pop! I really love how my DIY Shell Specimen Art looks on the Naval walls. 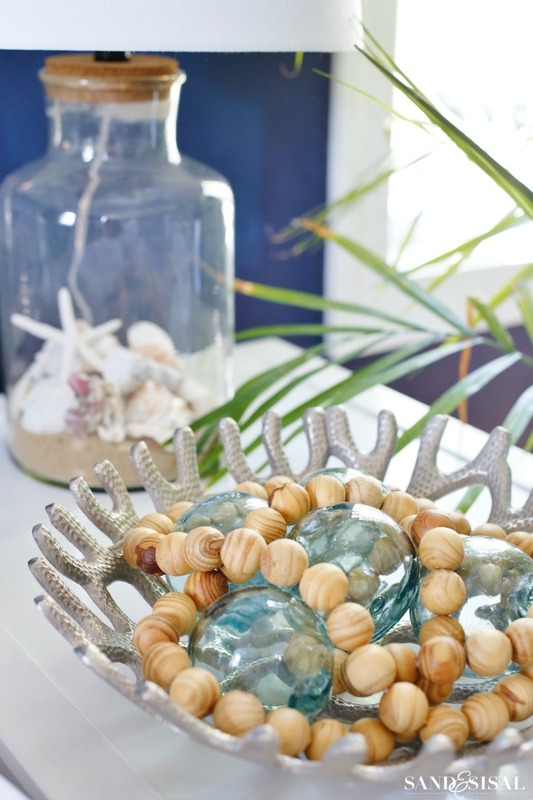 The easy to make DIY Wood Bead Strand looks fabulous draped over vintage glass floats. I wanted to buy these shibori framed prints for a year now but didn’t have a spot for them. This room is the perfect location! A nautical media room makeover required an update on the media console. I gave the media console a fresh coat of white paint. And to soften up the flooring I found this awesome woven denim ombre rug. 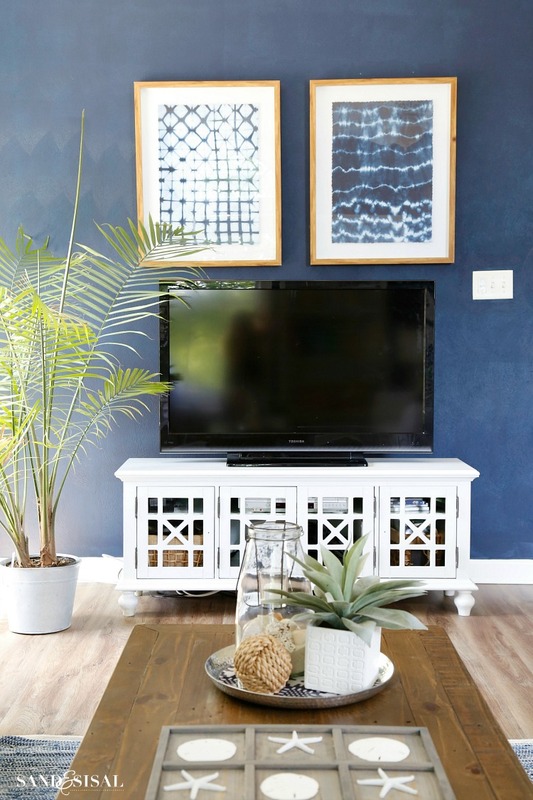 I hope you like our nautical media room makeover! It is ready for XBox gaming, movie nights, relaxation and FUN! Let the festivities begin! 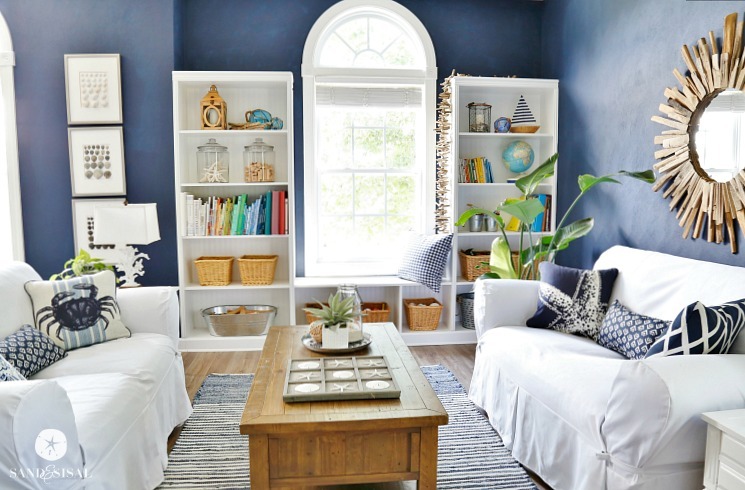 I’m not usually a fan of dark walls, but that blue is so cheerful and luminous with all of the light from the windows! I love it! Also, that faux wood pedestal is super cute!! I also really like the 3 seashell prints (are they prints?) going from light to dark. Such a nice, subtle look! Very pretty. Love all of the little touches throughout the room. The coastal tic-tac-toe board is genius! Love your new room. Great job. Did you have the slip covers custom made? Hi Maria! I ordered the slipcovers from SlipCoverShop.com. They were very affordable. Cold you tell me where you got your slipcvers? Love them. They would be perfect for my living room. Your room is gorgeous. Love the color. Sorry for the spelling. I meant “could” and “slipcovers”. 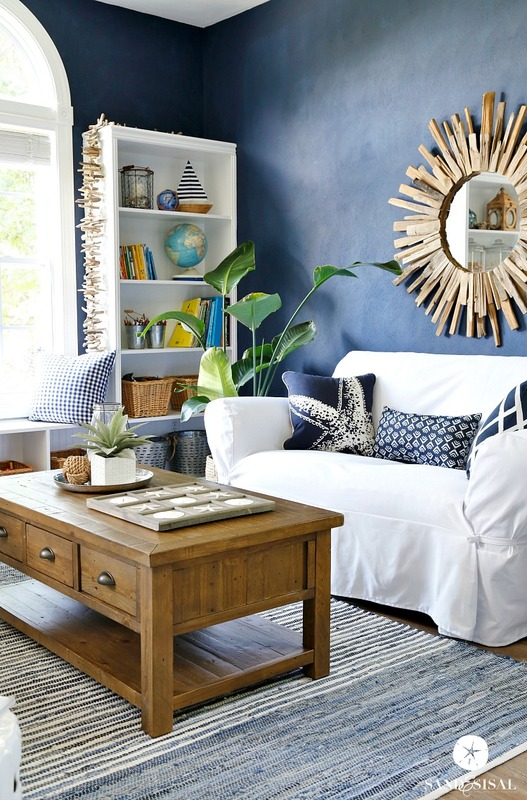 I absolutely love the navy with the brightness of the driftwood against it! I am a huge fan of navy and brass and wood together these days – I was thinking of doing our lower cabinets in the kitchen in navy with a quartz countertop and brass pulls. Then I went and painted the walls sage green, because the rest of the house is leaning toward French country instead of nautical, so…back to the drawing board. In the meantime, I’ll rejoice vicariously through your navy walls! Looks wonderful and the wall color came out great 🙂 Love it! Thanks Jessica! We’re loving it! I love every little bit of your room, those windows are incredible. Think will print out few pages of your photos for when I change our living room over to beach/lake idea just so I can refer to some of your wonderful ideas in that room. Love the blue walls. Navy and white. It is classic and it never fails to impress. 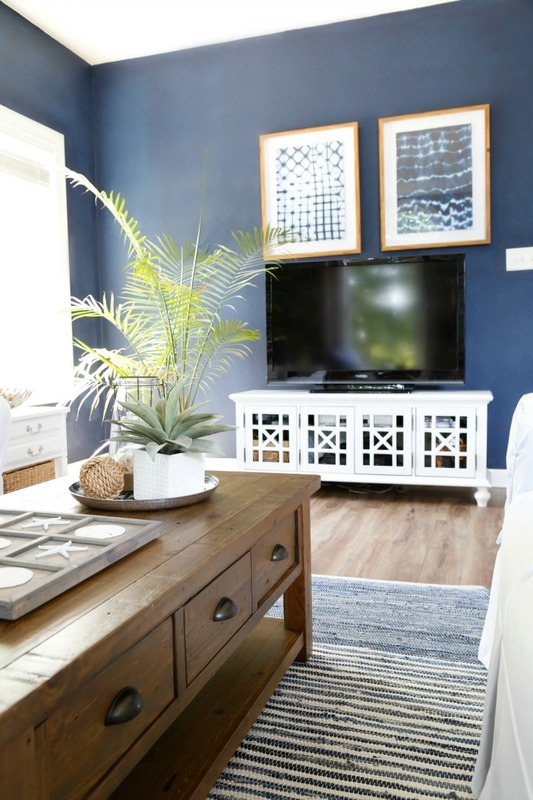 Love it and I am totally crushing on the repainted TV console. It just wows now that it is white. Such a great update. Thanks Pamela! The color had faded so terribly, it needed to be painted regardless. I still need to find new hardware for the doors yet, but it looks so much nicer in white. Have a great week! I love what you did to the room. I think that I will make something similar with some of our shells. Love your make over. I noticed in the picture of before that there was a low table full of leggo”s Last year my neighbor picked up a table just like that one except it had a complete cover of the green leggo sheets. No leggo’s in it but what a great find for 5.00 at a tag sale. Now it is full of leggo’s for her Grandchildren. Your new space looks spectacular. Everything fits so well together. Do you have any painting tips for cutting in along the ceiling edge, especially for such contrasting colors, where the edge is more noticeable? That is my least favorite part of painting. Thanks for the great tips. I’ve used them while doing several paint projects in our home over the past few weeks. We also have been making and installing frames for our bathroom mirrors by using your great detailed instructions from a 2011 post. I really like your diy tic tac toe board. I’ve been looking online to find the 9 grid opening wood board but not having any luck. Would you please provide me a link so I can buy some? I think these games would make great gifts. And may your Summer be filled with Wonder and Amazement as you help Mark with recovery…discover another world in books….reading or drawing, painting, etc. Hi Andrea! Thank you! I actually made the board. I’m hoping to write up the tutorial with links to all the items I used to make it, and publish it either this weekend or Monday. Thank you too for your encouraging words for Mark. ;) We have been playing games and doing lots of coloring too! Did you ever publish the DIY instructions/materials for the tic tac toe board with sea shells? So cute!! You should sell them!!! Beautiful room – thank you for sharing the photos. Thank you so much Caron! I’m glad you like it! We are really loving how it all turned out too! Wow that room is absolutely beautiful! I love the blue walls. My wife wants to do something similar to our bonus room for our beach house. 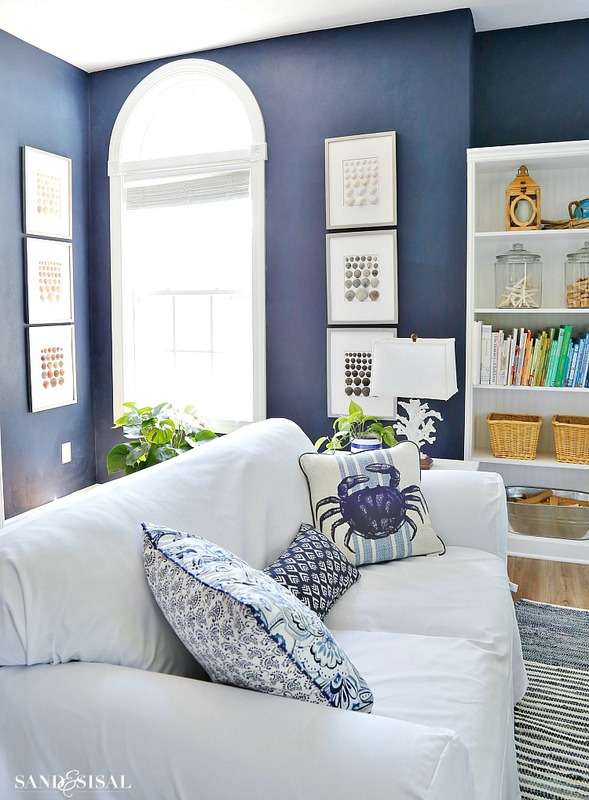 We have been debating on brighter wall colors, but that blue is really starting to make me think a little differently! Love it! Thank you so much! 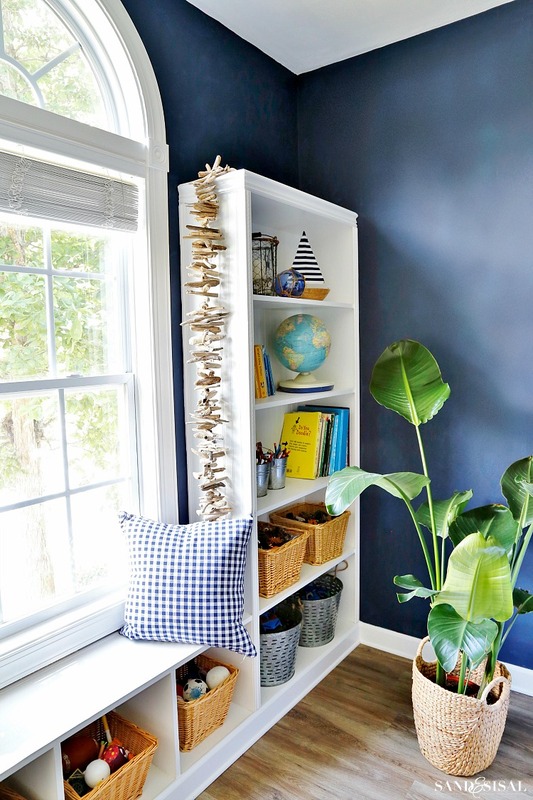 We are really loving the bold and beautiful navy walls. The colours of the rooms are stunning and most importantly to me, it looks like you have created a happy, positive atmosphere – great job!